Feat. Atanu, Hannah And Harrison. Finding a tutor who has aced your exact class can be a Godsend in your hour of need. A 30-minute session with a Vygo tutor can cost as little as $12.50 for half an hour and save you tears and a $1,000 wasted course fee. Atanu tutors Information Technology classes at Monash’s Clayton campus with high distinctions in all his classes. He is a five star tutor available in person both on and off campus as well as online via Skype. FIT3165, FIT3171, FIT4165, FIT5047, FIT5148, FIT5202, FIT9131, FIT9132, FIT9132, FIT9133 and FIT9134. Hannah is a third-year Psychology student at Monash’s Clayton campus with high distinctions in all her classes. She is a five-star tutor available in person both on and off campus as well as online via Skype. She tutors 24 classes including: ATS1091, ATS1092, ATS2093, ATS2094, ATS2095, ATS2096, ATS3095, ATS3096, ATS3097, ATS3098, ATS3099, PHY2011, PSY1011, PSY1022, PSY2061, PSY2071, ATS2093, ATS2094, ATS3095, ATS3096, ATS3099, PHY2011, PSY2061 and PSY2071. Harrison is an Information Technology and Science student at Monash’s Clayton campus. He has experience tutoring IT, Chemistry and Math and a keen interest in Astrophysics and Game Development. 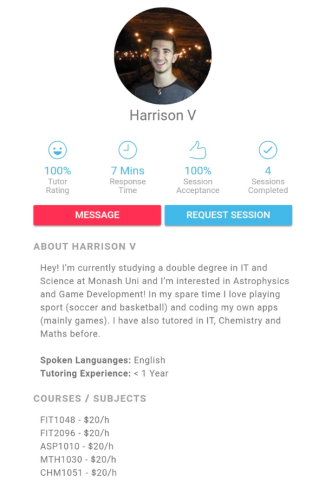 Harrison is a five-star tutor available in person on campus and online via Skype. He tutors six classes including: ASP1010, CHM1051, FIT1048, FIT2096, FIT2097 and MTH1030. Vygo tutors are relevant, personable and affordable. It’s a no brainer! Do you have a favourite Monash Vygo tutor? Let us know in the comments below to help us grow this list!